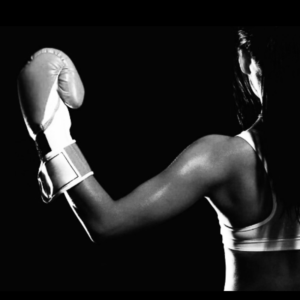 Boxing Classes Dublin - FIT-4-SUMMER BOOTCAMP - Sign Up Today! Spartan Boxing Classes in Dublin are Suitable for ALL LEVELS (Beginners to Advanced!). So you progress at your own pace, improving your fitness and skill each week. Our Boxing Classes have limited places and are all instructor lead, so no more training on your own in crowded gyms! GET FIGHTING FIT for SUMMER! *We understand your work/life schedule can change from time to time, so we are flexible about our Boxing Classes in Dublin and our Group times over the venues. So if you miss one of your boxing classes one week. You can attend another session to make the missed session up during the course. Those unused boxing classes cannot be refunded. However we do allow you to carry some missed sessions (max 6 boxing classes) over to next course and make them up then as long as you are still a full member. Our Spartan Lunch HIIT Conditioning classes allow you to get a challenging workout done at your lunch break so you can leave your evenings free to relax. Suitable for all levels, the classes are an intense 45 minutes which are focused pure fitness and toning within your hour lunch break! The classes consist of various rounds of High Intensity Interval Training (HIIT) which is proven to be the best way to burn fat, build muscle and cut weight. We also use boxing intervals, strength & conditioning exercises, and circuits in our fast-paced and fun sessions which are designed to boost your fitness and carve the body you desire in a matter of weeks! 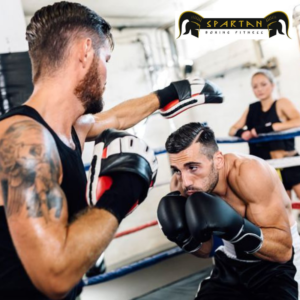 Why Choose Spartan Boxing Classes Dublin? Choice of Convenient City Centre locations and times – So you can Get a workout in on your way home from work leaving your evenings free to relax! Large Training Spaces – We have the two Biggest Boxing Gyms in Dublin City Centre with over 5000 and 3500 sq ft of training space! So No More waiting around on machines or training space in cramped sweaty gyms! We use Padwork in EVERY class (advancing each week) so you are not just hitting a Stationary Bag which gets boring quick! You never train alone, so you will ALWAYS work with a partner that will keep you on your toes for every class! Our classes have a good mix of guys and girls, and are also suitable of ALL levels! You should come prepared to our classes like any gym session you attend! CLOTHING – First of all, you are about to get sweaty. Keep that in mind when choosing what to wear our boxing classes. Also, realize that you are going to need full range of motion for much of your body in order to comfortably work out. Choose comfortable clothing that will give your arms and legs free movement. FOOTWEAR – Boxing shoes are available now in all different cool and comfortable styles. Regular athletic shoes are a good alternative if you cannot obtain boxing shoes, just make sure they are not too soft in the sole so you can “feel” the ground which is important for balance in boxing. GLOVES & WRAPS – We have gloves to borrow if you like but we always recommend our members to invest in their own personal pair. Gloves like shoes can take time to break in so it good if you have a pair suitable for your hands in size and shape. You can pick up suitable in most good sports shops as boxing is a popular sport! For girls we recommend size 8 or 10oz in weight. For guys we go with 10-14oz depending on the hand size. You should also get a pair of handwraps that will give extra protection to your hands while training. Feel free to ask our coaches to recommend retailers and brands they use! You will get small recovery breaks throughout the class. You can use these to take some fluids on board. We recommend drinking between 500-1000mls of water per hour class depending on the time of year and the intensity of the session. Also rehydrate after the class! We also recommend to have a towel with you as you will sweat! !